I finally decided to submit this wallpaper here. XD I made this four months ago for Secret Santa event on theOtaku. I love how this one turned out. X3 When I saw this awesome vector on AP, I decided to make a colorful wallpaper (though this one is not so colorful ^^;;). First I added a simple shadow to the vector, then I made some text brushes and put them there. I thought this would be a simple and easy wallpaper but it took me so long to arrange the text placement, font color, and typography. I worked quite hard on the background. I love the typography in this - those little details and words in his shadow are also cool as well as the overall elements in the background. But somehow, I can't help but feel the colors clash a bit. 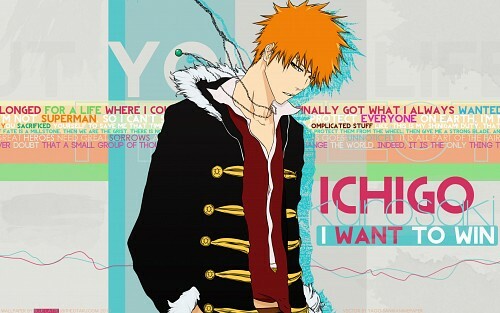 It's like....there are some reds and blacks missing in the background typography to better match Ichigo or perhaps it would be a good idea to change Ichigo's shirt into a more pink/purple hue to better match the typography then. NIce picture of ichigo and the colors look awesome in the back ground. Great work. tnx for sharing this.. one of my favorite protagonist!